The Belgian Congo/DRC has one of the longest lists of different international ovals, starting with no ovals (no cars?) during the Leopold private ownership period (King Leopold’s Congo Free State 1855-1908) then Belgium state-owned Congo Belgique until 1960. There followed RCL, CGO, ZR and ZRE, to DRC today (in which the ‘D‘ amusingly abbreviates the concept ‘Democratic!). Some of the codes overlapped. 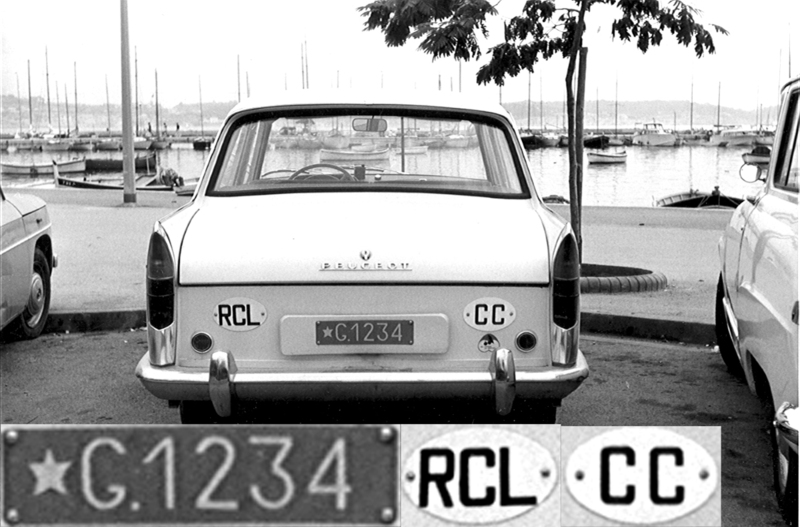 This RCL was photographed in Cannes during the early 1970s by VB on that great African car, the Peugeot 404. The front plate was a normal, yellow on blue, pressed ?Howoco? plate, but the rear plate had been lost and replaced by this well-painted version. Does the Consular Corps oval suggest that Congo had not established a special plate series for Consular in those years? THIS IS WHAT WE CAN NOW DO! Here is a new concept by means of which we can liaise with each other at will, on any subjects we choose. A mail system between members, starting from the RPWO web site. The (WordPress-hosted) Blog site can also be set to allow outsiders to read our correspondence and to contribute comments if they please. We might derive useful information or images from exposing our odd hobby to others! Entries to a blog are kept permanently, in date order, enabling subjects to be re-visited if required – say, before adding new information. Just log in here and write your first post!